Hardwood floors can be a beautiful addition to any home, but as with any natural product, there are questions about durability. Durability is hard to pin down because it can mean different things to different people. Is a floor more durable if it is less likely to be scratched or damaged? Or is durability about being able to renew the floor to like-new condition? For our purposes, we’re going to use durability to mean “stands up to everyday wear and tear.” With this definition, there are two primary factors to consider: hardness and finish. It’s worth observing that super-hard does not always mean “most durable.” Woods that are too inflexible are prone to cracking and splitting in dry climates, so it’s worth talking to an expert before settling on a favorite. Harder wood also comes at a much higher cost, which is likely a factor for most people. In general, though, harder woods are more durable. Soft floors like cork, pine, and black walnut will surely show the battle scars from pets, drops, and moving furniture. The finish on your flooring is what actually takes the abuse from daily traffic, kids, pets, and general wear and tear. There are plenty of options but the most common include urethane, shellac, and lacquer. Learn more about finishes in our guide to hardwood floor finishes. This finish dries clear and is generally favored for its ease of use and cost-friendliness. It’s not the least durable finish but it also isn’t winning any awards for longevity. These finishes give a high-gloss shine and are among the most common in the industry. Their combination of great looks and high durability make them a great choice for homes with children or pets. The main concern is that these finishes have harmful fumes and are flammable. It’s worth getting a hotel room and letting the house air out for a day after applying, but since the finish is so durable you’ll be able to go years between coats. If you just want it over and done with, lacquer is your best bet. It sprays on and dries fast, but be warned that it’s durability is suspect and you’ll have to make sure to ventilate thanks to harmful fumes. Shellac has long been a favorite of the woodworking industry because of its natural shine and low cost. The main downside with shellac is a tendency to wear off quickly, requiring more frequent applications than other finishes. 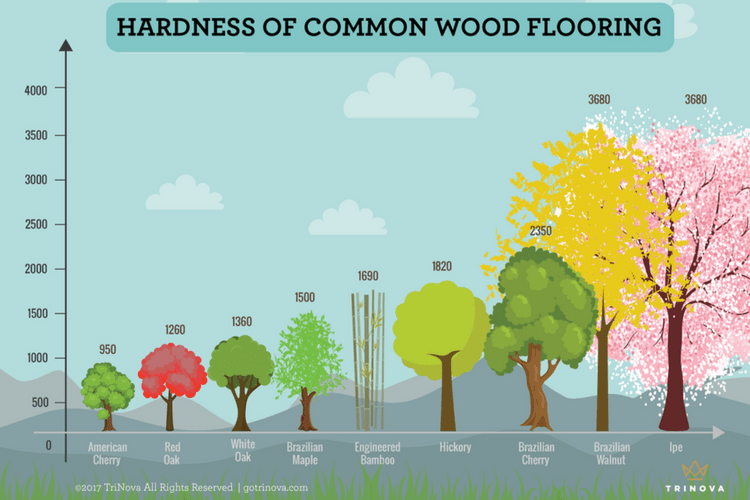 Factor in design fit, longevity, cost, and ease of installation when making a hardwood flooring decision. The most durable floors are hardwoods with a urethane finish. Do you have any hardwood floor nightmare or success stories? Share them in the comments below!